In a mixed decision, a federal judge ruled that LinkedIn users can proceed with a lawsuit accusing the social networking service of misappropriating their names and images with its email campaign. But the ruling, issued on Thursday by U.S. District Court Judge Lucy Koh in San Jose, Calif., also called into question whether the users will be able to recover monetary damages from the company. The dispute between LinkedIn and the users centers on allegations that the service sent email invitations to users' friends. The plaintiffs argue that LinkedIn violated a California law about endorsements by using their names and images in emails to their friends. Even though Koh dismissed the users' claim for statutory damages, she also ruled that they could amend the complaint and try again. In a portion of the ruling that marked a defeat for LinkedIn, Koh specifically rejected the company's request to dismiss the case on free-speech grounds. She said that the consumers adequately alleged that the email invitations were ads — which aren't entitled to the broad free-speech protections as editorial speech. The lawsuit dates to September of 2013, when four users — including Paul Perkins, a former manager of international advertising sales for The New York Times — alleged that the company violated the federal wiretap law by “hacking” into their accounts, in order to harvest their friends' email addresses. Koh rejected that claim in June, when she ruled that the users agreed to transmit an initial email invitation to their friends, but not necessarily two follow-up emails. LinkedIn subsequently asked Koh to dismiss all allegations relating to those two follow-up emails. Among other arguments, the social networking service said that it has a free-speech right to send follow-up emails, on the theory that the service helps people to communicate with each other. She adds that Perkins and the other users say the reminder emails are misleading -- in which case they wouldn't be protected by free-speech principles. “Plaintiffs allege that the recipients of the reminder emails were misled into thinking that Plaintiffs were the ones who kept spamming the recipients’ in-boxes with reminders to join LinkedIn,” Koh wrote. 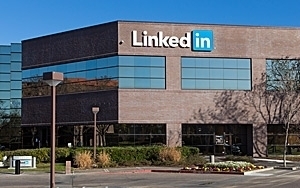 "LinkedIn Headquarters" photo from Shutterstock.